When we saw Jodi’s mosaic we knew we had found a beautiful and compelling way to describe the mission God has given our ministry. 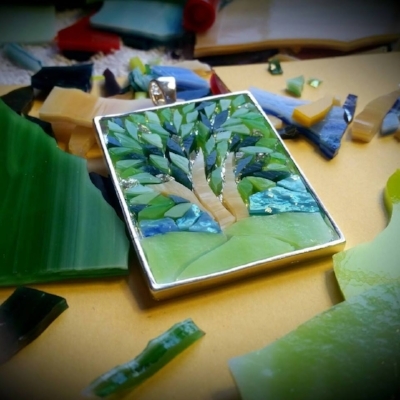 The colorful shards of glass remind us of how God restores the broken, rough-edged places in our lives and fashions them together safely within the silver setting. The tree planted by streams of water reminds us of God's invitation to simply be and live, allowing our roots to spread wide and deep into the soil of God's love. It is from this place that we then cooperate with God's spirit and become a place of shelter, nurture and nourishment for others participating in God's work of restoration in the world. The reflective shards of mirror set within the leaves keep us mindful of the way we see ourselves and the way God sees us. We truly are God's beloved and we are invited to live out that reality in each and every moment. The mosaic was created by Jodi Henriksen. You can see her lovely work and read her story here. Restoration Ministries was founded in 2006 by Rev. Jean Leih. God guided Jean to create a holy space where individuals and groups could experience the presence of Christ in everyday life through spiritual direction conversations, prayer, study or retreat. We continue the work, empowered by the same Spirit.